As it is the combination of two versatile developers, it brings the standard (BMW) along with the racing (MOTOGP) i.e. 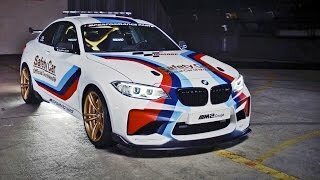 BMW M2 MotoGP Safety Car 2016 .It is also designed keeping the safety as one of the priority. There are many potent upgrades all the way round. Both the developers are looking to bring a change in the market with this combo pack model. Let us have a look at the review of 2016 BMW M2 Moto GP and get to know more about it. The interior of BMW M2 MotoGP Safety Car 2016 comes with the luxurious carbon fibre interior trim, stainless steel pedal pads and M Performance floor mats. Both the trim and the steering wheel are wrapped in beautiful Alcantara . There’s a Recaro racing seats with the Schroth belts assuring the safety of BMW M2 MotoGP Safety Car 2016 with the fuel suction pump and a master cutoff switch for the battery. Thus rounding up the interior details of BMW M2 MotoGP Safety Car 2016 I would call it sporty, elegant and a driver oriented amalgamation. The Exterior of BMW M2 MotoGP Safety Car 2016 includes carbon side skirts high-gloss black front grille, high-gloss black air breather, carbon mirror caps, front carbon blades, and a carbon rear diffuser. The front is modified with flap under frame, carbon rear wing with closed mounts, BMW M Performance coil over suspension, Michelin Cup Tires, and LED lights in the front and rear. Aerodynamic components are added specifically in the front and rear spoilers, to counteract the drag created by the light bar and mounting brackets on the roof. 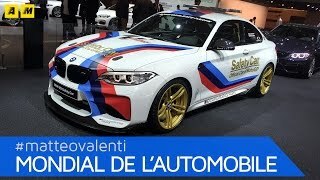 Thus rounding up the exterior details of BMW M2 MotoGP Safety Car 2016 I would call it the beauty with mesmerizing power and astonishing aerodynamic inclusions. Keeping Safety in mind, the Developers bought powerful but safer output with 370 horsepower and 465 nm of torque on tap. BMW M2 MotoGP Safety Car 2016 also includes speed limiter, which pretty quickly controls the speed of the beast to assure safety. The performance figures of BMW M2 MotoGP Safety Car 2016 are still not released, however we expect to have them in near future.